When life hands them lemons...send lemonade. Whether you know someone who is going through a tough time in their life or someone who is celebrating - sweet lemonade makes a delightful gift for any occasion! Sympathy, hard times, house warming, wedding, Christmas, birthday, anniversary, teacher, thank-you... the possibilities are endless! Our our Sweet Squeeze gourmet lemonade gift set will bring a little sparkle to the day. Our one-of-a-kind mixes are made from real lemon pulp and are all natural. Choose from the classic refresher, or get an extra zing with real strawberries! 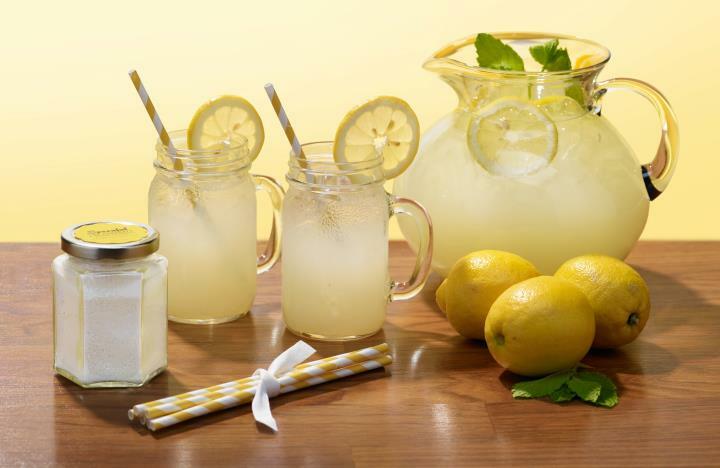 Two glass mugs help you serve it up icy cold with cheery vintage straws. 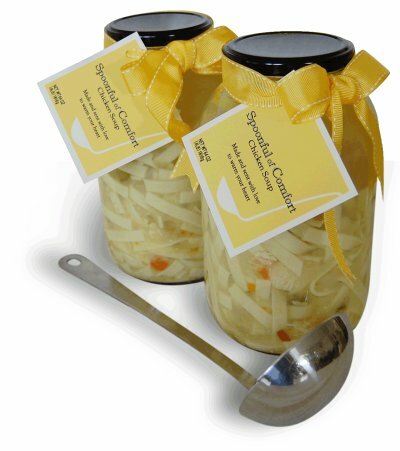 Spoonful of Comfort also delivers delicious homemade chicken noodle soup, dinner rolls and even cookies to your family and friends. 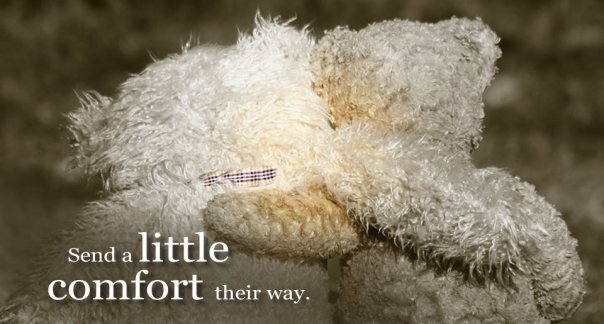 Whether they are ill, homesick, or even new parents - Spoonful of Comfort will brighten their day and warm their hearts! When my package from Spoonful of Comfort arrived, I immediately noticed the time (and special attention) that was put into packaging my shipment. Upon opening the box, I first saw a beautiful note and paper. The presentation alone is enough to put a smile on your face. The lemonade was simply delicious - the perfect amount of sweetness! As crazy as it sounds, I think I liked the straws best! They were so cute, bright and cheerful. My daughter loved them so much that she's saved one and is keeping it in her room on her dresser! What a touching story about how it all got started! I learned the the company start in Honor of her mother. It is her goal to help others with sick loves ones. AI learned a portion of the proceeds from a purchase of Spoonful of Comfort goes to Cancer Research! I learned that a portion of the sales goes to the Cancer Society. Great cause. I have 5 relatives with cancer. Every gift is packaged for temperature control and safety with insulated liners and gel packs to ensure that the soup remains chilled throughout the delivery cycle. Once it arrives, the receiver is instructed to refrigerate and enjoy within 2-3 days. They ship Mon-Fri. I learned that a portion of the sales goes to the Cancer Society. I learned they guarantee your complete satisfaction. If for any reason you are dissatisfied, please call and we will assist you with a prompt exchange, refund, or credit. I learned A portion of their sales goes to The American Cancer Society. I learned that portion of the proceeds go to Cancer research and that it's in remembrance of her mother. I learned that a portion of the sales go to The American Cancer Society, which aims to prevent cancer and help those who are suffering from it. I learned it has been featured on the today show!! I like that they have college gift packages. I learned this: "A portion of the proceeds from your purchase of Spoonful of Comfort chicken noodle soup will go to Cancer Research - by way of a memorial gift to celebrate the memory of my mother, Mona Bowes. The American Cancer Society's mission is to prevent cancer, save lives, and diminish suffering from this disease." Love it! Reading the story of how Spoonful of Comfort came to be made me cry. I lost my dad to lung cancer 4 years ago - he was 1 month shy of his 53rd birthday. He fought long and hard, and if I had known about this company, he would have received MANY packages from such a great company! They also have college care packages.